Detectives are investigating a deputy-involved shooting in Palm Harbor in which a bystander was shot. 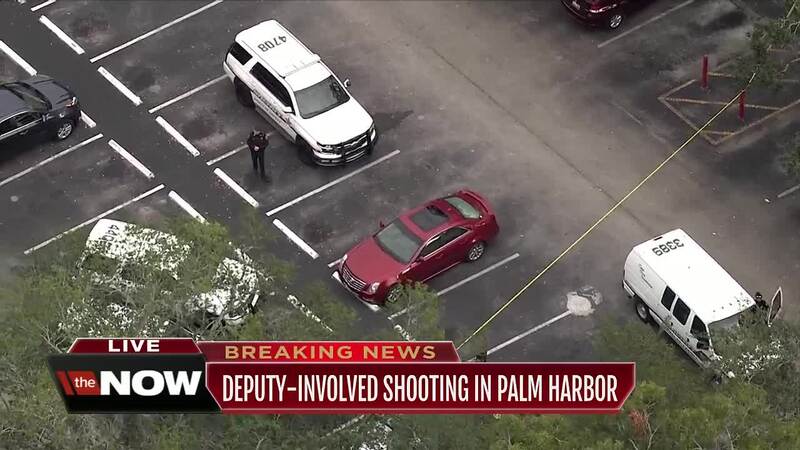 PALM HARBOR, Fla. — Pinellas County detectives are investigating a deputy-involved shooting in Palm Harbor in which a bystander was shot. According to the Pinellas County Sheriff’s Office, on Monday morning, deputies responded to an apartment complex located near 2480 Cypress Pond Road to investigate a vandalized vehicle. A resident at the Stillwater Palms Apartment told deputies that someone had broken out the windows of her Cadillac, which was parked in the apartment complex lot. "The back windshield was smashed. It looked like a little piece of something, metal maybe, something in there. The side passenger window was smashed," said neighbor Devonne Fox. Deputies spoke with neighbors to see if anyone knew who damaged the vehicle. Deputies made contact with 39-year-old Joshua D'Anastasio, who lived next door to the victim. D'Anastasio denied knowing anything about his neighbor’s damaged vehicle, deputies say. After leaving the scene, the resident called deputies and reported seeing D'Anastasio acting suspiciously and hiding a blunt object in the dumpster near their apartments. A deputy was speaking with the resident in the parking lot when D'Anastasio reportedly came out onto his second-floor rear balcony and began yelling at the deputy. Right next door, the resident’s boyfriend, was out on their second-floor rear balcony, when D'Anastasio began yelling and threatening him as well. Deputies say that D'Anastasio and the resident’s boyfriend were arguing over the balconies when D'Anastasio told the resident’s boyfriend that he “had something for him,” deputies say. D'Anastasio walked back into his apartment and returned to the balcony with his arm extended towards the resident’s boyfriend, holding what the deputy believed to be a gun. "There were just cops, one had his gun drawn yelling at the person not to move then I saw more cops coming," said neighbor Deidre Fox. 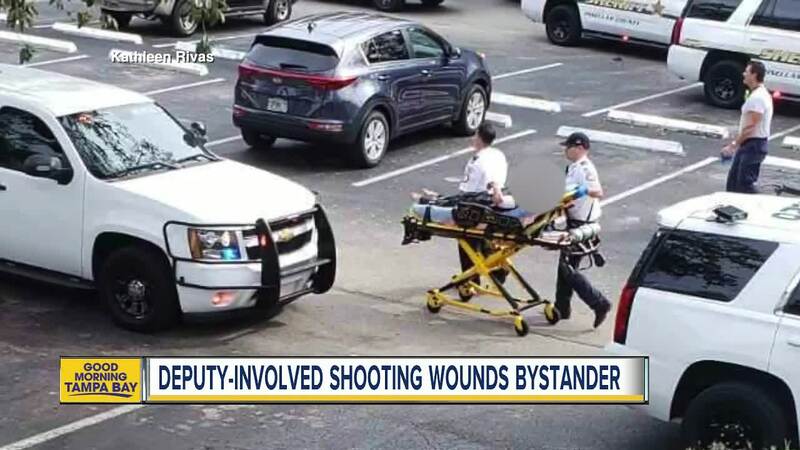 “Detectives say [the deputy involved] saw the muzzle flash and heard the gun go off as D'Anastasio discharged the gun at [the resident’s boyfriend]. 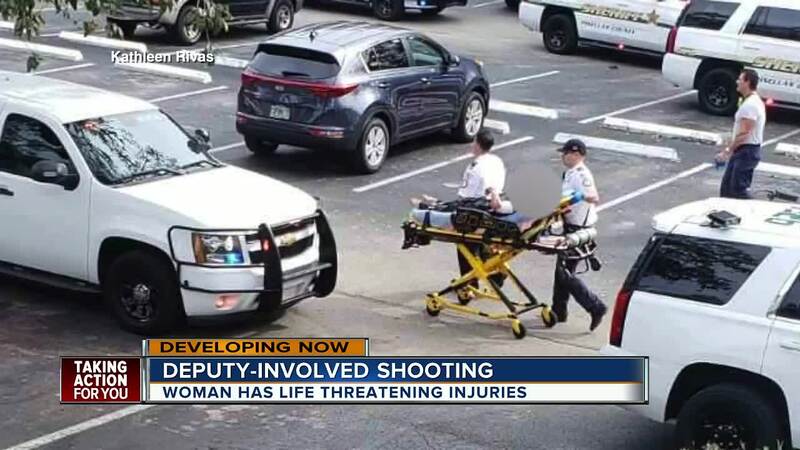 [The deputy] was in fear for the safety of [the resident’s boyfriend], [the resident], and himself when he returned fire at D'Anastasio discharging multiple rounds from his department issued handgun,” the Pinellas County Sheriff’s Office said in a press release. The deputy’s rounds missed D'Anastasio and shattered a sliding glass door behind him. As deputies were challenging D'Anastasio on his balcony, D'Anastasio's girlfriend, 42-year-old Gwen Stubbs, came out of the apartment bleeding. Deputies took D'Anastasio into custody without incident and rendered medical aid to Stubbs. Paramedics transported Stubbs to a local hospital for injuries consistent with a gunshot wound to her left arm. Detectives recovered the gun D'Anastasio discharged at King and determined it was a flare gun. Detectives also learned that the deputy never saw Stubbs because she was inside D'Anastasio's apartment behind the sliding glass door at the time of the shooting. Detectives say there were multiple witnesses to the incident including a Sheriff's Office forensic science specialist. D'Anastasio was arrested and charged with one count of Aggravated Battery with a Firearm. He was transported to the Pinellas County Jail without incident. The deputy involved will be placed on routine paid administrative leave.